Katie is a freelance hair stylist based in Wiltshire. 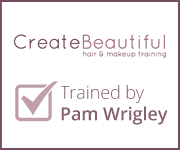 Training with award winning stylist Pam Wrigley at her create beautiful hair courses, Katie has lots of experience in adapting styles to suit each individual client. Whether that’s changing how the hair falls around your face to compliment your jaw line, pinning in a certain way to cover your ears or working around a special accessory you’d like built into your style.